I can still remember the first time that I set foot in my home. I had been looking to buy a single family house for a while and I hated everything that my real estate agent was showing me. I did not think that I was asking for much - just 3 bedrooms, 1.5 baths, 2 big closets in the master bedroom, forced heat, central air, tall ceilings, hardwood floors throughout, and a quiet manicured neighborhood. Now looking back I see that really was a tall list of wants. My home hit all the wants on my long list and it has served my well over the last 16 years. But now it is starting to show its age. After 14 years of my son's abuse, the rooms are not as pristine as they used to be. Things are looking a little stale and a little worn. Now I don't have the stomach, nor the funds, for a total redo. My plans entail more of a freshening since I still love the overall way my home looks. And I know just where I want to start - in my pink and blue bathroom. 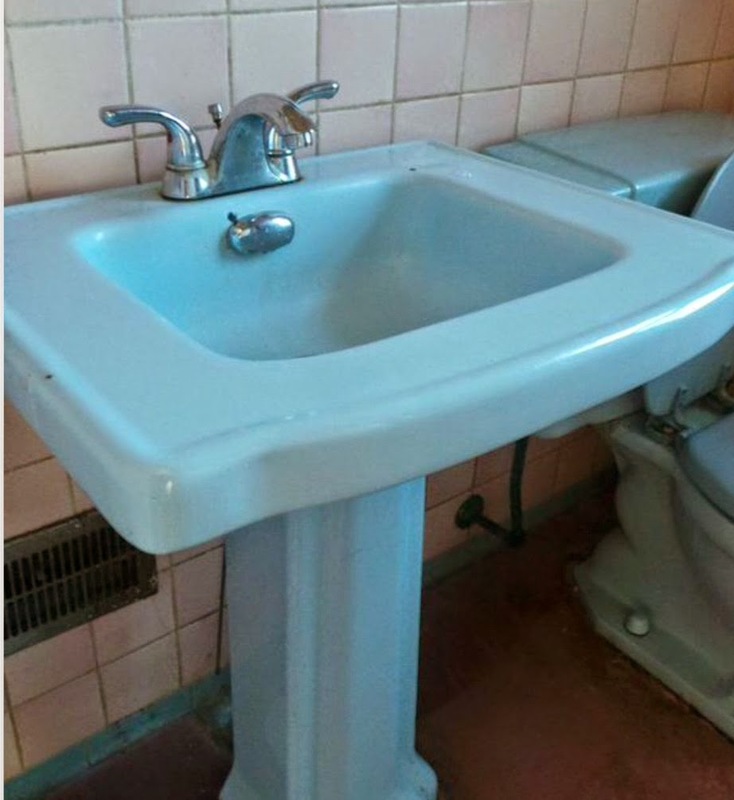 Now I am sure that you are probably grimacing from the color combo that I just mentioned, but my bathroom's decor has grown on me over the years and I love my original circa 1943 blue pedestal sink and pink tile work on the floor and walls. But what I don't like are the fixtures. My shower head and sink faucets have seen better days. My sink faucet is over 10 years old and my shower head is over older and replacing them is where I plan to start my updating. 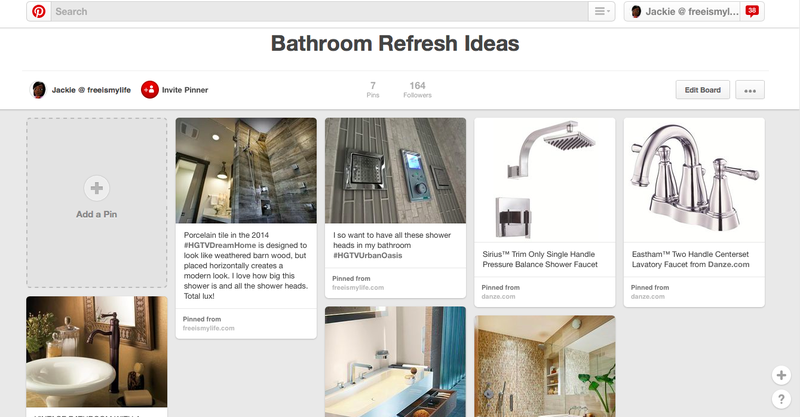 I love beautiful faucets and fixtures since I think they are like the jewelry of a home. 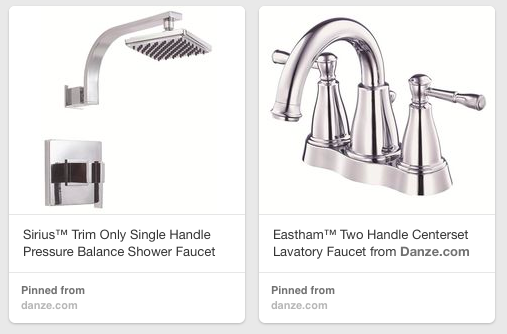 I have been having a great time using social media sites like Pinterest and Houzz to put together design boards of shower heads and bathroom faucets that catch my eye. And I am finding that I can purchase beautiful fixtures at all price points. I especially love using the Houzz app on my iPad since it contains tons of beautiful photos of professionally designed bathrooms of all sizes, shapes, and costs. Houzz allows you to create an account and make idea books to organize all the photos that you want to keep. It also allows you to upload your own photos to be part of the idea books.